One of the biggest problems I had with the whole let’s burn Teldrassil to the ground for no good reason opening to Battle for Azeroth was not only was it a senseless act of horrible, wanton slaughter on noncombatants, it was one my Tauren was complicit in. At no point during the quest dialog did I means to argue my dissatisfaction with the idea — I couldn’t say Hey, Saurfang, I’m a freaking hero of the Horde and I’m not going to help you march a Horde army into Ashenvale unprovoked and you shouldn’t either. I’m not saying you had to have a problem with the quests — I’m saying that if you did have a problem with them (and I did) that there was nothing for it but to either just not do the quests at all or hold your nose and help invade knowing how it would all end. Apparently the folks at Blizzard are taking this kind of thing into account in at least one bit of questing currently available on the 8.1 PTR. And I think it’s a very positive development for how World of Warcraft tells stories and involves our characters in them. In the continuation of Saurfang’s story, players can choose to assist Zakhan the Troll (you may know him as Zappyboi) or they can choose to stay loyal to Sylvanas. This choice has consequences — rather than head off to save Saurfang you head to Orgrimmar to report on Zakhan’s disloyalty to Sylvanas, who makes some ominous statements on what the future holds for him. That’s pretty bad… for him, anyway… but as a player I like that Horde players will get the option to pick a side here. 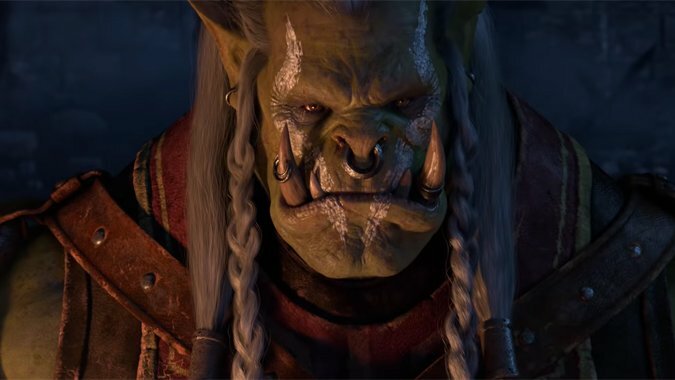 That way, if you choose to take the quest and help Saurfang, you’ve taken a stand against Sylvanas and her actions as Warchief, and if not then you’ve supported them openly, not just tacitly. It’s an option I wish they’d work into more quests. Imagine if, when we found Gul’dan trapped as the power source for the Dark Portal in Warlords of Draenor, there had been a dialogue option saying there’s no way I’m letting Gul’dan live and then you tried to stab him? Sure, he’d escape anyway because the expansion needed him to, but at least it’s not because you didn’t know better than to let him go. Or if the quest in Borean Tundra where you torture Malygos’ agents for information let you could refuse to do it. Or if the aforementioned Ashenvale quests let you refuse to help the Horde invade or maybe even just balk right at the end and don’t help Saurfang attack Malfurion. The idea of letting players say “No, Genn, I’m not going to help you attack the Horde in Stormheim, we’re fighting demons!” seems like a great one to me. I hope this gets implemented more than just this one time.